You can add the cash register to the list of endangered technologies that tablets and smartphones are killing off. But the iPad and Square-powered Cashbox promises to give them one last hurrah before they completely fade away. The lovely wooden enclosure includes an iPad connected to a Square reader, which makes swiping credit cards a bit easier thanks to a bamboo case around the tablet. It also pivots, so the cashier can enter the purchase details while the customer signs for their purchase. The Cashbox includes a receipt printer tucked away inside, as well as a locking cash drawer for customers who still want to pay with pieces of paper and metal discs. The basic Cashbox, even without an iPad, is still a hefty $900. 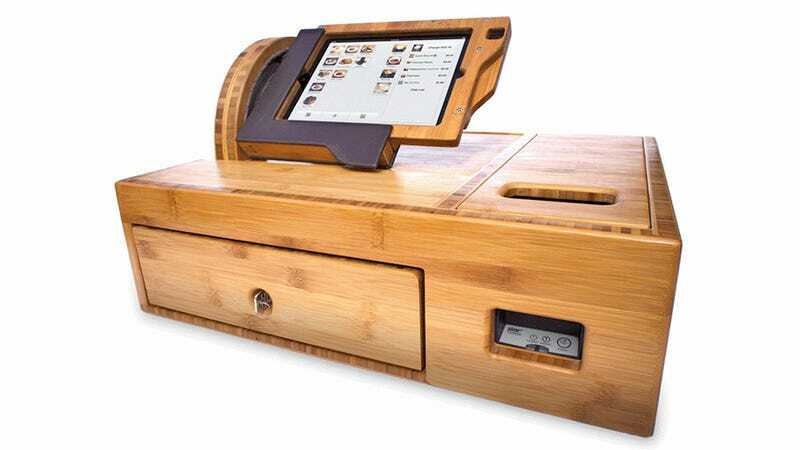 But it can be fully configured with custom laser etching, different types of bamboo, and more sophisticated cash drawer hardware, pushing it closer to $1,200+. Survival never does come cheap.